Time and again we have heard about the pesticide, glyphosate, making its way into our food chain, our medical treatments – children’s vaccines – and impacting on our life. Monsanto’s attempts to debunk WHO claims that the pesticide is indeed, a carcinogen, has generally, fallen on deaf ears. Over the last year, we here at the Anon media faction has highlighted the plight of bees and their necessity to our livelihoods. Quite simply, without the bee to pollinate, we would very quickly discover the devastating impact on our food supply. 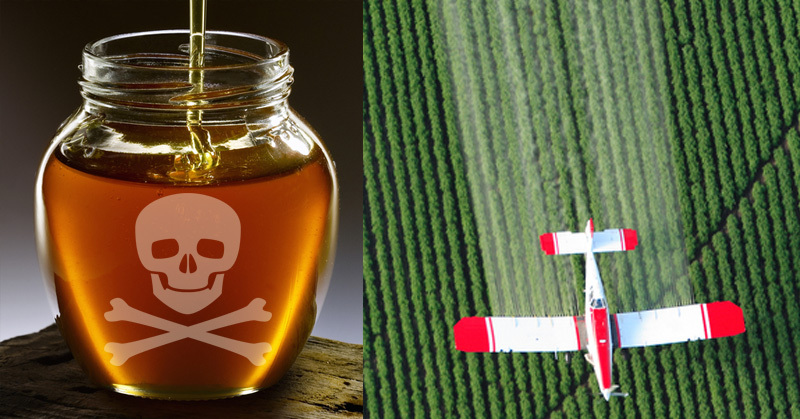 One scientist, in a leaked document stated that it is more difficult to find honey that is not tainted with the carcinogenic glyphosate. “It is difficult to find blank honey that does not contain residue,” he says. “I collect about 10 samples of honey in the market and they all contain glyphosate.” He further states that organic mountain honey, although still contains the chemicals, contains the lowest traces. Common sense from here, tells you that those bees which survive the pesticide spraying will naturally carry the chemicals with them as they harvest pollen. As with all things, a process such as this, where the bee and the flower are tainted, naturally, the taint will progress into the end product – in this case, honey. Alarming as this may be to honey lovers out there, at this stage, official health organizations see no reason to instigate concern. And they won’t. At the merger of Bayer-Monsanto, the chances of anyone scrutinizing the formidable company is highly unlikely. Tags: dystopian environments, dystopian themes, food, Glyphosate, GMOs, Health, Honey, Humanity, Monsanto, news, the lazy dystopian, what is dystopian? Previous With Talk of WWIII on the Horizons, How Serious is It?